Both Princess and Crystal Cruises offer Hawaii cruises from San Francisco. Each of these adventures include round trip journeys so you will begin and end your trip in SF. You will also stop at some of the most popular ports of call in Hawaii, including Honolulu, Lahaina (Maui), and Hilo. Both of these trips also include a stop in Ensenada, Mexico. These lovely cruises include plenty of days at sea for you to relax and unwind. But don't worry, you'll also get plenty of time to check out each port city during your stops. The 15-Night Hawaii Island Cruise offers nine full relaxing days at sea. It stops in four ports in Hawaii and one in Mexico. In Hawaii, you will get the chance to visit Hilo, Honolulu, Kauai, and Maui. On the way back to San Francisco, you will make a quick evening stop in Ensenada, Mexico. Your trip finishes with one last day at sea until you arrive in San Francisco on the morning of Day 16. Your trip is aboard the Grand Princess. This large cruise ship features space for around 2,600 passengers. In addition, it has several pools, a full-service spa, and a pool side movie theater. You can also entertain yourself in the casino, watching a nightclub-style performance, or in one of several lounges. There are a number of fine dining and casual eating restaurant onboard. In addition to the traditional cruise dining rooms, you can also step inside one of the speciality restaurants that offer Italian cuisine, steaks, or seafood. Or, you can grab something from one of the casual restaurants that offer pizza, burgers, and ice cream. If you prefer a night in, the Grand Princess also offers 24-hour room service. Day 1: You will depart San Francisco at 4pm. 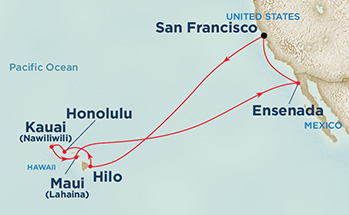 Day 2 - 5: You will spend your first four days at sea as you head west to Hawaii. Day 6: Your first stop is Hilo, Hawaii. You will arrive around 8am and depart at 5pm. Click here to learn more about what there is to see and do in Hilo. Day 7: The next morning, you will arrive in Honolulu at 7am. You will have an entire day to explore this beautiful waterfront city. The ship departs at 11pm. Click here for tips on what to see and do in Honolulu. Day 8: You will then arrive at Kauai (Nawiliwili) the next morning at 8am. You will have until around 5pm to enjoy your stop. Click here for tips on visiting Kauai. Day 9: Your final stop in Hawaii is in Maui (Lahaina). You arrive at 7am. The ship departs at 6pm. Click here to find out about the top things to do at this port. Day 10 - 13: After you leave Maui, you then begin your journey back to the mainland. On these four days, you will be at sea. Day 14: On the evening of the Day 14, you will arrive for a short stop in Ensenada, Mexico. You will have about four hours to visit, grab some dinner, and learn more about this historic town. Day 15: On Day 15, you once again have a relaxing day at sea as you head north to your final stop in San Francisco. Day 16: Your journey ends on the morning of Day 16 with a 7am arrival in San Francisco. Click here to visit Princess Cruises website to learn more about these dates for this 15-Night Hawaii Islands Adventure and other Hawaiian cruises. The 16-Night Hawaiian Cruise with Crystal Cruises is similar to the one outlined above. However, it stays in port one additional day in Honolulu and visits Kailua-Kona instead of Kauai. This cruise is aboard the Crystal Serenity. It's the largest ship that Crystal runs and it includes space for just over 1,000 passengers. The space-to-passenger ratio ensures you don't feel too crowded during your journey. Onboard the Serenity, you will find several high-end boutiques, plenty of comfortable chairs to lounge by the pool, and several places to grab something to eat. You can also check out their state-of-the-art 24-hour computer lab, a Dolby-equipped theater, and lavish casino. You will have plenty to entertain you during your days at sea. Day 1: You will leave San Francisco at 5pm on Day 1. 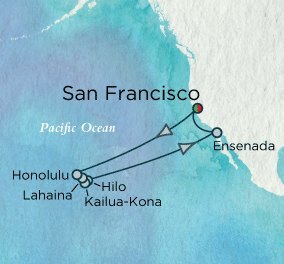 Day 2 - 5: For the next four days, you will be at sea on your way west to the Hawaiian Islands. Day 6 - 7: On Day 6, you arrive in Honolulu at noon. Your ship will dock overnight so you have two full days to explore Honolulu. The ship is scheduled to depart at 11:59pm on Day 7. Click here for ideas on the best attractions and activities in Honolulu. Day 8: The next morning you arrive at the port of Lahaina, Maui. You will have all day to visit this colorful island. You will arrive at 8am and the ship leaves at 11:59pm. Click here for ideas on what there is to see and do here. Day 9: Your next stop in in Kaulua-Kona. Your arrival is again first thing in the morning at 8am. You will stay here until the ship leaves at 6pm. Click here for ideas on what to see and do in Kona. Day 10: Your final stop in Hawaii is on Day 10. You will arrive at Hilo at 8am and explore this fun little place until 3pm. Click here for ideas on what to do in Hilo. Day 11 - 14: On Day 11, you will start your journey back. You will head east and spend the next four days at sea. Day 15: On the evening of Day 15, you will get the chance to spend a few hours in Ensenada, Mexico. You will arrive at 4pm and depart at 9pm. Day 16: You will spend one additional day at sea as you head north to San Francisco. Day 17: On the final day, you will arrive in San Francisco at 8am. Hilo is on the big island of Hawaii. This lovely port of call is home to around 40,000 people. During your stop here, you can check out the rich history of this beautiful town during a guided walking tour or on your own. You can also head west and enjoy some adventure, such as hiking, ziplining, or a visit to the summit of Mauna Loa, one of the world's largest volcanoes. Click here to find out more about the shore excursions in Hilo. You will find plenty to do and see in Hawaii's largest city, Honolulu. You are welcome to explore this gorgeous city on your own or on one of their popular shore excursions. Top options include a tour of the city with a stop at their best attractions, including the Pearl Harbor Museum. You can also learn how to surf, go snorkeling, or head under water on the Atlantis Submarine Adventure. Click here to learn more about the shore excursions available in Honolulu. Kauai is another wonderful stop in Hawaii. It's the oldest of the Hawaiian islands and offers lovely beaches and plenty of places to explore. The most popular trip here is to Waimea Canyon. During this tour, you will also see Hawaii's first sugar cane plantation and watch as Spouting Horn at Po'ipu South Kauai throws sea water 50 feet into the air. Click here to learn more about this shore excursion. Lehaina is the perfect place to explore on your own. You can head to one of its gorgeous beaches for the day or explore the city on foot and learn more about its history. It's also a great place to go whale watching or head out to see the Haleakala Crater (a volcano that forms more than 75% of the island of Maui). Click here to learn more about the Maui (make sure to look for Lehaina) shore excursions. Kaulua-Kona (or just Kona) is located on the western side of the big island. At this port, you will also find a variety of adventure activities as well as plenty of space on the beach to relax. Coffee lovers should also check out the famous coffee grown here. It's also a fun place to enjoy on foot. If you plan to stay in San Francisco either before or after your cruise, I recommend looking at options in the Fisherman's Wharf district. It's the closest district to Pier 27, where the cruises dock, and it is home to Pier 39, Ghirardelli Square, and the ferries to Alcatraz. Click here to find my list of recommendations in the Fisherman's Wharf area.